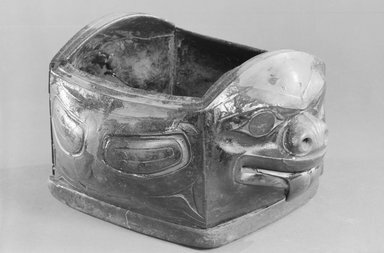 The object is a bent-corner, box-shaped feast bowl having a bear's face with protruding tongue on one end and its tail on the other. The second face on the bear's tail is a visual pun. The object is in fair and stable condition. Although the wood appears to be extruding oil in some areas more than others, the wood is stable. There are several minor cracks on two of the sides of the bowl which are stable. Previous repairs to the side corners remain secure. The join on through the large face where a break was repaired appears firm and stable. According to Robin Wright, Burke Museum, April 16, 2003, this is not Haida because the eye socket lines run right out to the lips of the bear, which is distinctively Tlingit. She added that if the Tlingit still owned the piece, they would have cleaned up the oil and darkened color.